I love this book. It collects lots of fun art ideas and projects for the artist in you to explore, and they are easy to follow along. The 52 projects included covers a variety of medium such as oil, watercolour, acrylic and pastel. 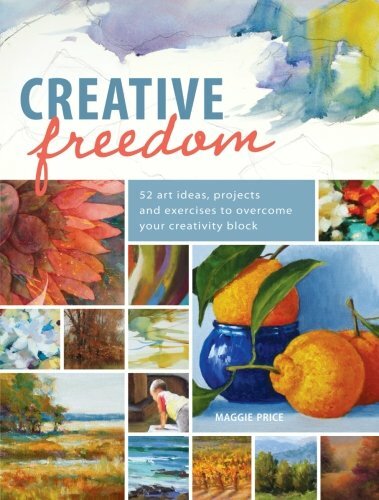 25 guest artists contributed to the book, including the author Maggie Price. Even though quite a few mediums are covered, and the artists may use their preferred mediums, many of the ideas and techniques mentioned can probably be applied to the medium you use. For example, some of the projects are like "Use a limited palette", "Paint a subject that's new to you", "Change your tools", "Paint in a new location", "Paint in a different size or format" and many more. Each project has step by step tutorials and pictures from start to end, with steps clearly described and easy to understand. Then, there's a short profile of the guest artist with a website provided which is great. You can pick one project for each week for a year, or turn to any page to get going, or start from cover to cover. It's a fun book highly recommended to all artists who want to try something different to get inspired.